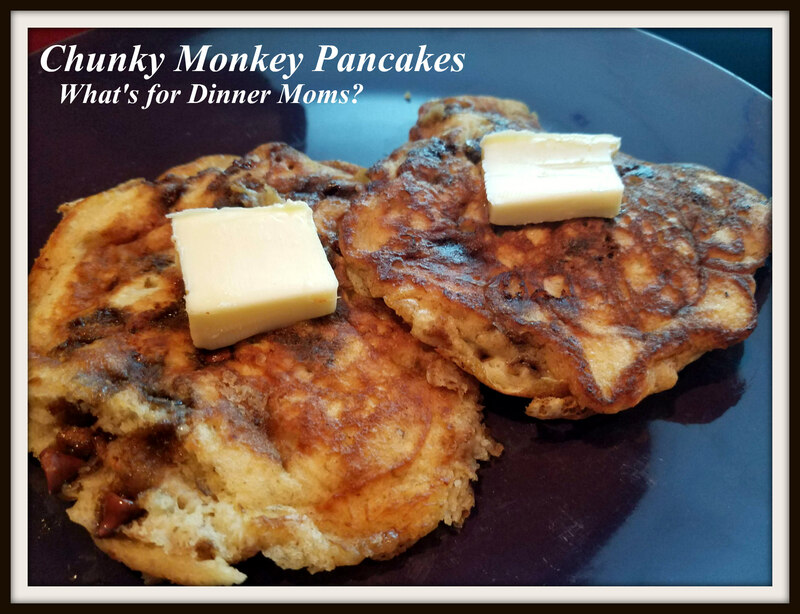 Chunky Monkey Pancakes – What's for Dinner Moms? One of my daughter’s favorite ice creams is Chunky Monkey. A banana flavored ice cream with chocolate pieces in it. As I was trying to come up with a new pancake flavor to make this is what was what we had ingredients for. We are still trying to get dinner on the table as often as possible through all the crazy days. 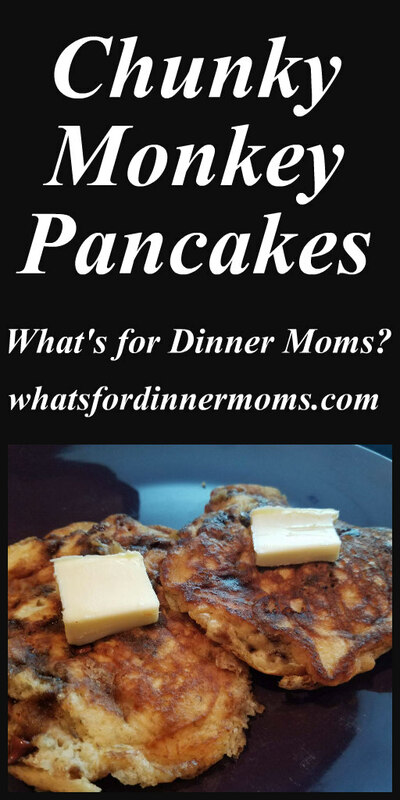 Breakfast for dinner is always a quick and easy way to get the whole family to sit down (or they freeze well for later breakfasts so make a double batch). You know when your children are saying, “Yum!” as they take their first bite it is going to be a huge hit. These had a great banana flavor without being overpowering. The chocolate added a bit of sweetness to the pancakes. I preferred them with a bit of butter and warmed maple syrup but the rest of my family ate them plain. Serve this with a fruit salad for a delicious dinner. Great banana and chocolate flavor in a pancake! Stir together the flour, powder, soda, salt, and sugar. In a second bowl, stir together the buttermilk, eggs, vanilla, and butter. Mix the wet ingredients into the dry. Stir in the bananas and chocolate chips. Heat a griddle over medium heat. Turn down as the griddle gets hot. Pour 1/3 cup of batter onto the griddle. Cook until the sides are slightly browned and the pancake starts to form little bubbles on the top. Flip and cook until browned. These look so yummy. We always have pancakes for Thanksgiving breakfast and Christmas morning. I will have to try making these this year, Thank you for the recipe.